Lulus Exclusive! Feel the fresh ocean air in the Lulus Seaport Navy Blue and White Striped Tie-Front Dress! 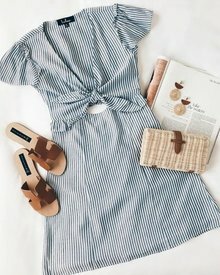 Navy blue and white striped, lightweight woven rayon shapes ruffled short sleeves, a plunging V-neckline, with a tying bodice with front and back cutout. Fitted waist (with more ruffles) tops an A-line skirt. Hidden side zipper. Fit: This garment fits true to size. Length: Mid-thigh. Size small measures 33 from shoulder to hem. Bust: Works best for A to C cup sizes - consider sizing up for fuller bust. Waist: Fitted - very fitted at natural waist. Hip: Loosely Fitted. Undergarments: May be worn with petals, or no bra. Fabric: Fabric has no stretch. Fully lined. 100% Rayon. Hand Wash Cold. Imported. Lulus | Seaport Navy Blue and White Striped Tie-Front Dress | Size X-Small | 100% Rayon.